Did they damage the gear and engine during the first landing attempt? A photo on Jetphotos shows the right gear and flap? damage on the climbout after the first attempt. According to AvHerald the engine, gear and flap were damaged during the first landing attempt. A THY Turkish Airlines Airbus A320-200, registration TC-JPE performing flight TK-1878 from Milan Malpensa (Italy) to Istanbul (Turkey) with 97 passengers, landed on Istanbul Ataturk Airport's runway 05 at 10:22L (07:22Z) but rolled right just before touchdown causing the right engine and wing to contact the runway and a hard touch down. The crew initiated a go-around, then declared emergency due to an engine (V2527) inoperative. The crew subsequently reported an unsafe gear indication. The aircraft positioned for an emergency landing on runway 35L, touched down about 20 minutes after the go around, but with the right main gear collapsed the aircraft skidded on its right engine, with sparks and smoke trailing the engine, and veered right off the runway spinning nearly 180 degrees. The aircraft was evacuated via slides while emergency services started to spray the aircraft. There were no injuries, the aircraft received substantial damage to right hand engine and its pylon as well as to leading and trailing edge high lift devices at the right hand wing. The airline confirmed the aircraft went off the runway during an emergency landing, the 97 passenges have been safely evacuated, there are no injuries. A passenger reported the aircraft was on its first approach to Ataturk's Airport uneventfully until about 100 feet AGL when the aircraft suddenly rolled heavily to the right and fell down onto the runway, while on the ground the aircraft was still tilted to the right, the engines accelerated and the aircraft became airborne again, the passenger thought the right main gear had collapsed at that point already. While positioning for the second approach another passenger yelled "Fire". Cabin crew instructed the passengers to brace for landing. The second touchdown was smooth, however, there were scraping sounds from the right, the passenger did not notice a gear collapse during roll out, only after the aircraft had slowed significantly the aircraft began to veer to the right. The doors were opened, passengers directed to the left forward and right rear doors for evacuation, when the right hand overwing exits were opened foam from the fire engines entered the cabin. About 5 minutes after landing busses arrived and took the passengers to the terminal. Fantastic piloting skills. Great job from the crew. 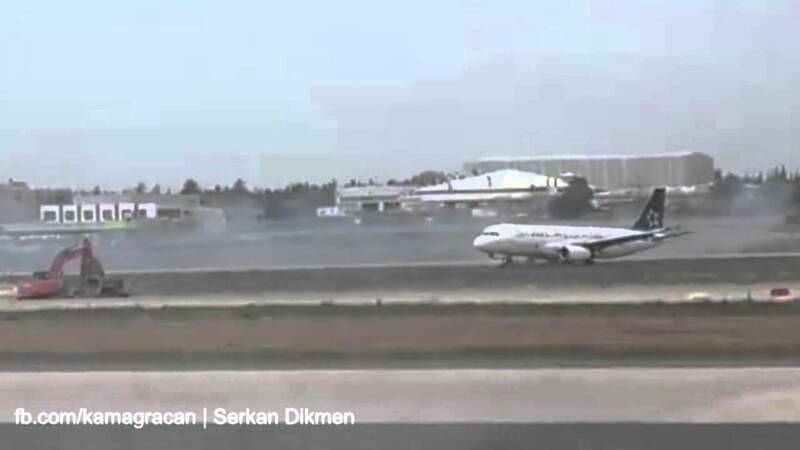 Note how the plane stay aligned with the runway until speed fall down to a low value. Now, all the experts will urge the ICAO to give back the controls to the pilots. I wonder why the construction workers that can be seen on the lower left portion at the end of the video were not instructed to leave the crash zone. Last edited by TomcatViP; 27th April 2015, 04:44.